If you look in the bradleybirth.com directory, you’ll find that I am the ONLY Bradley instructor here in the United Kingdom! I received my training in Chicago, Illinois, USA and soon after, my husband took a job here in Hamble, so here I am now! 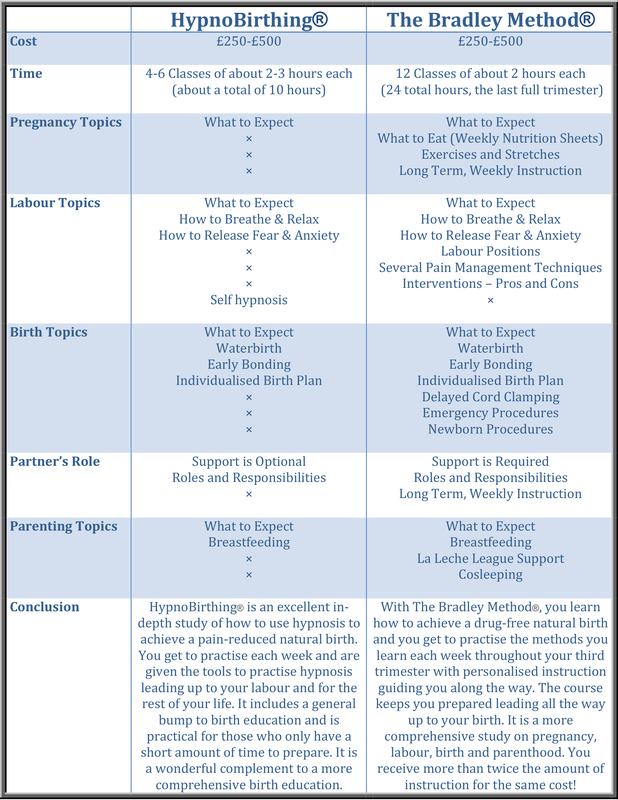 I have noticed how many HypnoBirthing teachers there are in the area and wanted to help inform you as to what the Bradley Method® is in comparison. “HypnoBirthing is a complete birth education programme, that teaches simple but specific self hypnosis, relaxation and breathing techniques for a better birth. Most importantly, you’ll learn how to put yourself back in control of your birth – rather than blindly turning your birthing experience over to your doctor or midwife. HypnoBirthing doesn’t mean you’ll be in a trance or a sleep. Rather, you’ll be able to chat, and be and in good spirits – totally relaxed, but fully in control. You’ll always be aware of what is happening to you, and around you. HypnoBirthing doesn’t require any particular belief system, or prior experience. Some of our mums (and especially their husbands!) have been very sceptical at first – until they experience it for themselves. In fact, the more sceptical they are to start with, the more evangelical they are when they discover the power of HypnoBirthing. Just imagine welcoming each surge! Feeling peaceful… relaxing… and even smiling as your baby comes closer to you! “The Bradley Method® teaches natural childbirth and views birth as a natural process. It is our belief that most women with proper education, preparation, and the help of a loving and supportive coach can be taught to give birth naturally. The Bradley Method® is a system of natural labor techniques in which a woman and her coach play an active part. It is a simple method of increasing self-awareness, teaching a woman how to deal with the stress of labor by tuning in to her own body. The Bradley Method® encourages mothers to trust their bodies using natural breathing, relaxation, nutrition, exercise, and education. The Bradley Method teaches couples ways to stay low risk. While occasionally there are risk factors out of your control, staying healthy and low risk can help to avoid complications. Low risk mothers have more choices. I believe that both HypnoBirthing and The Bradley Method® are great courses that will significantly prepare you and reduce your risk of cesarean section. HypnoBirthing has more emphasis on techniques to help you have a pain-free labor and birth (they do not guarantee that it will be pain free!) whilst the Bradley Method® is more comprehensive and covers a lot more information from a healthy pregnancy to healthy baby. It includes various pain management techniques, such as B.E.S.T. (Bradley Energy Saving Techniques), as well as helping you plan birth scenarios with in-depth study on interventions and emergency procedures. It is also unique in its 12-week long course so you don’t have to worry about forgetting what you’ve learned and helps remind you to continue eating right and doing your exercises! Ready to sign up for classes? Fill out this form today!